Clay animation has always held a special place in the hearts of Tim Burton and his fanbase. In 1982, when Burton made Vincent, his directorial debut, the medium of stop-motion animation had been virtually dormant for years, employed only in the form of visual effects or children’s fare. Burton’s vision, however, was wonderfully dark and unique. Filmed in black and white, his six minute film about a young boy who idolizes Vincent Price (who provided the film’s narration) showed enormous promise and opened up a new world of potential for clay animation which The Nightmare Before Christmas later explored with great style and success. 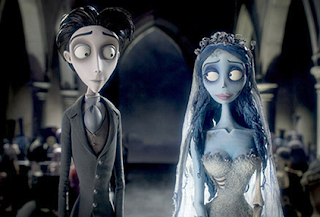 Burton’s latest clay-animated work, Corpse Bride, follows in the tradition of Nightmare, but the greatest similarity shared by the two is their uniqueness. Corpse Bride is a work of art all on its own. The story is set in 19th century Europe. Victor (Johnny Depp), a shy and introverted young man, finds himself betrothed to Victoria, a young aristocratic woman (Emily Watson). The marriage has been arranged by their parents who are thinking only of financial gain, but Victor becomes even more shy and intimidated after meeting Victoria and finding that he actually loves her. In an effort to overcome his nervousness, Victor rehearses his marital vows in the moonlit forest, only to find that he is standing on a grave site and has inadvertently proposed to a dead woman. Emily, the “corpse bride” (Helena Bonham Carter), whisks Victor away to the land of the dead, leaving him wondering what will come of his newfound marriage and whether or not he will ever return to fair Victoria’s side. Whereas The Nightmare Before Christmas was fairly straightforward, Corpse Bride will hit various age groups at different levels. The 19th century setting of a society bound by unspoken formality feels a lot like Jane Austen, but the elements of class struggle are certain to soar above children’s heads. The film’s first act shows a glorious world existing mostly in shades of gray. Burton has built his career around this visual style (Edward Scissorhands, Sleepy Hollow), but Corpse Bride’s social satire reinforces the visuals in a way never seen before. It seems perfectly fitting for the drab concept of a passionless marriage to be joylessly painted. Once the title character steals Victor away, however, vivid colors burst into view, for only in the land of the dead do bright colors exist. This aspect of the film reminded me of why people fell in love with Tim Burton’s work in the first place. It’s an apparently backwards idea that dark and macabre subject matter could provide color and meaning for a film, but Burton places this paradox at the heart of his work. Fans of Tim Burton will recognize his various visual trademarks and will also be delighted at how the art of clay animation has furthered and developed. You can definitely tell that stop-motion is being used (which in today’s world of Computer graphics is quite charming), but the characters have much more facial expression than they did in The Nightmare Before Christmas. These expressions make it much easier to connect with the characters early on, as well as compliment the vocal performances of the actors. Both the realm of the dead and the world of the living are glorious to behold; nothing about the setting seems real, and this helps offset the inherent absurdity of the story. The animation is beautifully executed and will keep viewers of all ages adequately intrigued. While some scenes might be frightening for small children, nothing gets out of hand in regards to how death is portrayed. Every time I feared that the story was straying too far for kids, it always managed to stay within the confines of family entertainment. Like The Nightmare Before Christmas, Corpse Bride is a musical, although this aspect of the film could have been stronger. Only a handful of short numbers punctuate the film’s duration, and none of them are very memorable. Danny Elfman’s compositions are always fitting and often brilliant, but Corpse Bride seems noncommittal, having one foot in the musical realm and the other foot out. Everyone who saw Nightmare spent the next few weeks humming its memorable tunes, but Corpse Bride’s musical numbers, while appropriate, aren’t necessary. Still, this film marks another successful venture for Tim Burton. It’s certainly not for everyone (you probably know by now whether or not it’s for you), but his fans have always appreciated his willingness to produce original art, much of which has little mainstream appeal. If you’re wondering why I can’t stop referencing The Nightmare Before Christmas, it’s because that film was a landmark achievement for Burton. On paper, it was a movie made for no one; besides being the first full-length stop-motion animated film, it was a musical which was too dark for most children and too goofy for most adults. Burton made it, though, and his films continue to find their well-deserved following. I’m pleased to announce that Corpse Bride is no different, presenting us with something that is fun and fresh, yet for fans of Tim Burton, strangely familiar. In 1989, director Tim Burton achieved the unthinkable; he crafted a cinematic masterpiece from a comic book. Before Burton’s Batman, comic book characters had been brought to life only in slightly goofy forms, such as Christopher Reeves’ Superman or ... (sigh) ... Adam West’s Batman. After Burton’s fresh and artistic portrayal of the Dark Knight, he returned with a darker, more sinister, and ultimately Burtonian sequel. Then Burton stepped down, and Joel Schumacher directed the average third film and the abominable fourth, and the franchise was essentially declared dead in 1997. So, when I heard there was a fifth film in the works, I was highly skeptical. When I heard that Christopher Nolan (Memento) would be directing, I felt a little twinge of hope. When I saw Batman Begins and it was one of the best superhero films ever made, I was more than pleasantly surprised. This latest installment completely severs ties with the previous four films. Whereas the third and fourth movies tried to imitate Tim Burton’s artistic vision, Batman Begins completely starts over. Everything from the mythology down to the visual style is brand new, and that’s a much wiser decision than trying to replicate someone else’s vision. Christopher Nolan has given the character a wonderful fresh start. As you might have gathered from the title, Batman Begins tells the story of how and why billionaire Bruce Wayne (Christian Bale) transforms into the legendary enforcer of justice. Young Bruce falls into a cave early in the film and is haunted by the thousands of bats he encounters there. His father reminds him, “We fall so that we can learn to pick ourselves back up.” Bruce has a hard time picking himself back up after he sees his parents murdered on the streets of Gotham. As young Bruce Wayne is sitting in the police station, a policeman sees him and says, “Good news, son: we got him,” referring to the thief that killed Bruce’s parents. The look on Bruce’s face tells us that he isn’t interested in justice; a far cry from what he will eventually become, young Bruce Wayne just wants his parents back. As a young adult, Wayne travels to an icy, extreme location in the east where he joins a justice-based organization led by the mysterious Ra’s Al Ghul (Ken Watanabe). In the frozen waste lands, Bruce trains with Ducard (Liam Neeson) and learns the ways of combat and stealth. Wayne returns to Gotham City with the intention of slowly restoring justice. However, he knows that one man is too vulnerable to achieve this feat, so he vows to become more than a man. He vows to become a symbol that will be respected and feared. He vows to become a legend. Christopher Nolan made all the right decisions when directing this film. The original Batman was fanciful and visually lush, but Nolan presents us with a highly realistic tale of Batman. Very little seems far-fetched about this story of Wayne’s journey into darkness, and that functions as a double-edged sword of sorts. Because the film is very dark and seemingly real, it’s also not much fun, or perhaps it’s a different kind of fun. You won’t leave the theater cheering the way you did after Spiderman 2, but this is exactly how it had to be. Fanciful action and visual effects weren’t going to cut it if we were to believe in the origins of the Batman legend. I didn’t think there was a good explanation for how and why a billionaire could actually have become a bat-man, but Nolan’s film won me over. However, that’s not to say that Batman Begins isn’t exciting. This film is oozing with action of all kinds and maintains a pretty fast pace. But once again, the presentation is more gritty and realistic than in the previous films. The action scenes are dimly lit and edited so that you can barely tell what’s happening. Some action sequences are just downright confusing, but they help to enforce a reoccurring theme of Batman Begins that none of the other films picked up on: fear. The Dark Knight is supposed to be a scary, fear-inspiring figure, and thanks to Christopher Nolan, he finally is. Christian Bale does a fine job as the caped crusader, making Batman’s presence on screen much darker and more frightening. Every time he appears, both heroes and villians are frightened of him. This element becomes the film’s prime mover, and it’s ultimately so crucial in making the story believable and taking away the inherent absurdity. Suddenly, Batman isn’t just a grown man dressed as a bat. He’s a dangerous man with a fractured history of wrongdoing and mistakes - a man you wouldn’t want to come across in Gotham’s seemingly endless night. 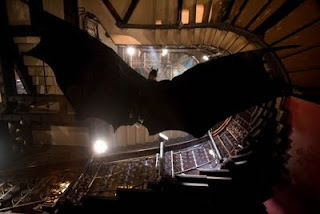 Batman Begins works on many levels and is one of the year’s most pleasant surprises, though a few elements fall short. Katie Holmes is stale and forgettable as Bruce Wayne’s love interest, and the very talented Tom Wilkinson just doesn’t fit the mold of the crime boss he portrays. Still, these are fairly minor complaints. The film ends with a fun wink at fans of the Batman mythology, serving as a lead-in to the inevitable sequel to-come. The real success of Batman Begins is the way the story’s emotion takes center stage. Through darkness, depth, drama, and intrigue, this film reminds us of why we fell in love with the character of Batman in the first place.